What is PRECISION HALF WAVE AND FULL WAVE RECTIFIERS? An increasing voltage follower can be converted into a ideal half wave rectifier by adding two diodes as shown in circuit diagram. When Vin is positive Vo becomes negative and diode D1 gets Forward biased at the same moment diode D2 is reverse biased. 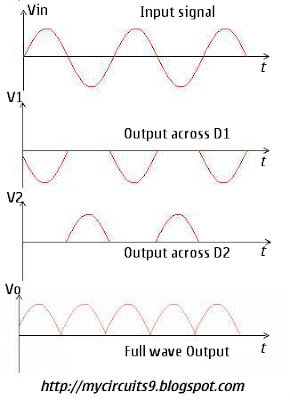 When Vin becomes negative, Vo becomes positive and diode D2 gets forward biased corresponding to the applied sine wave Vin. Positive going ripples appear at output V2 and negative going ripples appear at output point V1. A full wave precision rectifier is also called as absolute value circuit. The First Operational amplifier (OP AMP) (shown in circuit) act as inverting amplifier while the second op amp act as Non Inverting amplifier. 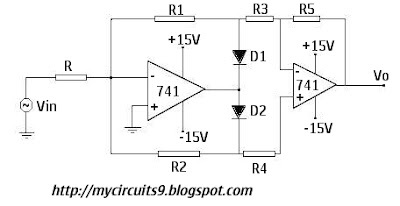 The circuit mainly works in two modes, depending upon the polarity of input voltage. One is inverting and the other is in non inverting mode. When Vin is Positive diode D1 conducts at that time diode D2 doesn't conduct. 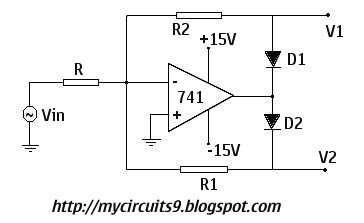 The limitation of this circuit is that it doesn't have high input Impedence. Op amp rectifier is also called as precision rectifier, because it is able to rectify lower amplitude signals. In ordinary diode rectifiers it need a minimum input voltage, in the order of cut in voltage of diode.